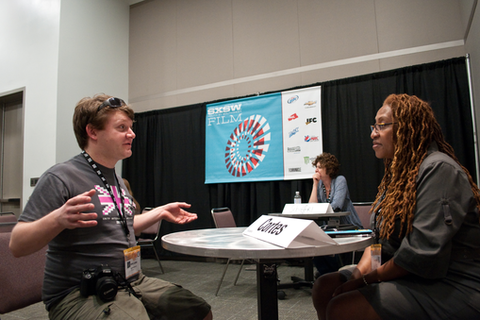 Meet with industry professionals who can give advice and answer questions about distribution, distribution options, and more for Documentary Films. Amy Letourneau is the Senior Director of Acquisitions for PBS Distribution where she oversees home, educational and digital licensing in North America. PBS Distribution is the leading distributor of public television programming both domestically and abroad. PBSd represents a wide range of documentaries including films from Ken Burns (THE CENTRAL PARK FIVE and THE DUST BOWL), from award-winning series such as NOVA, FRONTLINE, AMERICAN MASTERS and NATURE, as well as dramas from MASTERPIECE and popular children’s programming. Amy co-leads the PBS/ITVS Indies Lab which has released over 150 independent documentaries across multiple digital platforms since 2009 including SXSW films THE PARKING LOT MOVIE, THE INTERRUPTERS and SUNSHINE. In 2009 Greg founded and runs Syndicado Inc., the only VOD aggregator of film and TV content offering broad outlet distribution and marketing at that time. The company has expanded and now has an offices in the US and in Canada, providing distribution to vudu, Netflix, iTunes, Microsoft, Amazon, Google, hulu, Fandor, Dish, Samsun, Rogers, Bell, Sony and more. Our clients include other tech savvy film distributors, sales agents, film makers and TV producers - all seeking new revenue opportunities through digital distribution and marketing. While we have a content base in documentaries and factual TV programming our library has expanded in to narrative feature films, pushing our content offering to over 300 titles. We launch content strategically and windowed to maximize revenue and avoid cannibalizing the value of a title. Our services included encoding, delivery and marketing, specifically editorial support for new releases and evergreen classics. Syndicado is Greg's second start up. With humble beginnings in corporate banking and "on set" in production, Greg has spent most of his career at the edge and confluence of tech and entertainment. From founding his first tech company, Hype! Inc. in the 90's which he sold to a US company to developing new digital distribution businesses for one of Canada's leading networks. To help market and raise the profile of documentaries, he launched ilovedocs.com in 2012. He has been a volunteer digital advisor for the Buffalo Olmsted Parks Conservancy as well as a tech advisor for the Learning Enrichment Foundation. He's been a speaker at the Banff International TV Festival on the future of digital distribution and won the Festival's Bell Media iPitch Award for best interactive TV project. Molly Thompson launched and runs A&E IndieFilms, the network’s feature documentary division. A&E IndieFilms’ productions include the Oscar-nominated, Sundance Award-winner “Murderball,” the Oscar-nominated “Jesus Camp” and the Emmy Award-winners “The Tillman Story” and “Under African Skies.” Thompson executive produces the division’s original productions including: “My Kid Could Paint That,” “American Teen,” “The September Issue,” “The Tillman Story” and “Client 9: The Rise and Fall of Eliot Spitzer.” Thompson’s latest film for A&E IndieFilms, “The Imposter” was shortlisted for Best Documentary Feature in the 2012 Academy Awards. It was also nominated for Best Documentary Feature at the 2012 Critics’ Choice Movie Awards and received two nominations for the 2013 EE British Academy Film Awards (BAFTAs) – Best Documentary and Outstanding Debut.